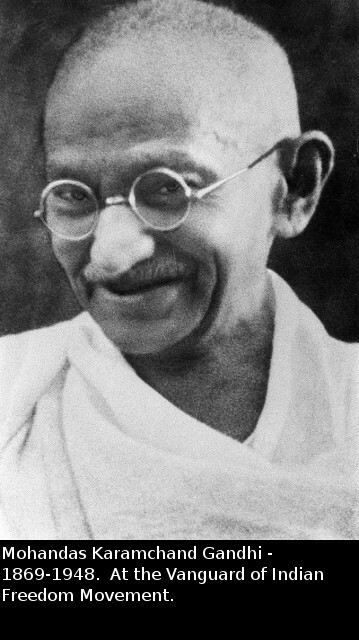 In the Post-Independence Era, earlier people used to occasionally exclaim: "If Gandhi were alive today, he would have committed suicide, unable to see India-to-day," or on similar lines. Now-a-days, people appear to have stopped doing it, because probably, they may be wondering "How many times, will he commit suicide?". He might have committed suicide long back, during the Era of Indira Gandhi's Rule. Now, during the Rule of our Hon. Prime Minister Shri Narendra Modi, will Gandhiji's Ghost (if at all it exists) ever visit India, or his birthplace Porbandar in Gujarat? In the context of what is happening, and what is going to happen, in India to Retail Trade, consequent upon the takeover of Flipcart by Wallmart, it is worth musing over what will be in store for Indian Businesses. The things that will destroy us are: politics without principles; pleasure without conscience; wealth without work; knowledge without character; business without morality; science without humanity; and worship without sacrifice. Latest Proof we can get from Karnataka Elections 2018. Here on the right side is the Home of the Richest Businessman of India: Shri Mukesh Ambani. Reported to be the most expensive residential property in the world after the Buckingham Palace. The 4,00,000 sq. ft. building is located on Altamount Road in South Mumbai. Estimated cost, at the time of building: $1 billion. 27 floors. Ms. Nita Ambani is reported to have set herself apart as a passionate philanthropist, leading the development of a model township, an elite school, and a Premier League cricket team. Incomplete. To come back and continue adding/deleting/modifying. 1. The Times newspaper in London yesterday reported an interview with Mr Ratan Tata, Chairman of Tata Sons, which took place two months ago. In the interview Mr Tata speaks about the management ethos of Corus and Jaguar Land Rover at the time of acquisition. He says that managers' work ethic at that time was not to "go the extra mile" and to leave early on Friday afternoons. We wish to make clear The Times claims that Mr Tata said British managers were "lazy" is misrepresentation. At no stage in the interview did Mr Tata make this comment. 2. We would also like to clarify on stories in Indian media regarding Mr Ambani's home. The report is out of context and factually incorrect. Mr Tata's comments on wealth are in the larger context of the growing disparity in the society. The comments seem to have been deliberately sensationalised. Let us assume that Mr. Ratan Tata's remarks were misreported both by the Times, U.K. and the Indian news media. Won't it be proper for Tata Sons to place the video recordings of Mr. Tata's interview with the 'Times, UK', so that people can clarify for themselves where the misreporting and sensationalisation has taken place. We as common people presume that in these days of computers and videos, the newspaper as well as Mr. Tata might have made out copies of the interview said to have been given two months back. A newspaper may have its space constraints to reproduce the interview verbatim. But what prevents Mr. Tata (or Tata Sons) to make the interview videos public? Did they give any undertaking to the Times that the video will not be revealed at any cost? Public interest, now demands its revelation. On Oct. 15 - 2007, I wrote about the view of Mr. Sheldon G. Adelson, C.E.O., Vegas Sands Corp., U.S.A., that there are no profits in hospitality and that they are in gambling. Here is the link to my blog. The Express published an interview with the Executive VP of the Carlson Hotels, India and Asia. According to the interview, they have 34 hotels and by the year end they will be adding another 20. By 2012, they will have 134. They have big plans. 1. If Carlson Hotels can make profits from "hospitality industry" without adding "gambling", why the third richest American Mr. Sheldon G. Adelson cannot do? 2. Both are American Companies. 3. So who is right? Are you searching for Indian Native Herbs and Ayurvedic Remedies? Welcome to yb HERBS and Ayurvedic Medicines Search.This is in Beta Stage of Development. It can be tried, for whatever it is worth. Data being updated by ybrao-a-donkey. Note: ybrao-a-donkey is not a Medical Doctor. This Search page is NOT intended to be any sort of medical consultation. The search results here, knowledge gained here are NOT substitutes for Consulting a Medical Doctor with Appropriate Qualifications and Registrations. While every effort is made to provide correct and latest data, no liability or responsibility, whatsoever, can be accepted for errors which may take place. This is a precondition, for using this Search Page. ybrao-a-donkey is not any type of agent of anybody. Wherever Marketers' / Makers' names and addresses are given, they are only Unverified information, given for representative purposes only. Any transactions can be made with them only after due diligence and verification, at the risk and responsibility of user. If erstwhile owners work as Accountants or while away their days on the ladders of swimming pools in five star hotels, what will the poor have to do? They have to work as security guards dancing around the fences erected by the new owners.